Bosch revolutionized their technology with the 1297D 1/4 in. 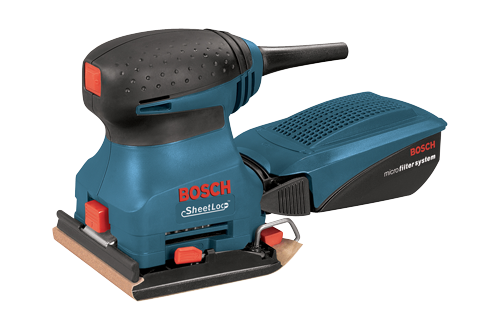 Sheet Orbital Finish Sander by making it quick and easy to load sandpaper on the deck. By Integrating their Sheetlock sandpaper attachment system, the user can pen the front and rear rubberized paper clamps, insert the edge of the paper in the front, wrap and clamp. What sets the 1297D apart from any other technology out there is that as the rear clamp closes, it pulls the sandpaper taut and flat against the bed. This vital development prevents wrinkles, creases and tears which increases the life of sandpaper without having to pay double the cost for stick on paper.